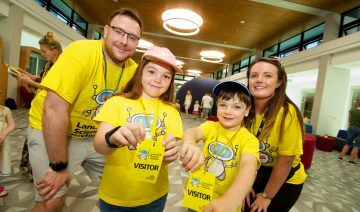 Lancashire Science Festival is back with a bang for 2019. You can look forward to another action-packed fun fest showcasing the wonders of science, technology, engineering, mathematics and more. Prepare to be amazed! 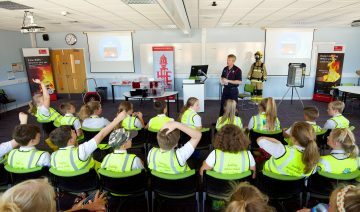 Our three-day extravaganza will be taking place from Thursday 27 June to Saturday 29 June on the University of Central Lancashire’s Preston Campus. On Thursday 27 June and Friday 28 June we will be welcoming thousands of children from primary schools across the region. Then on Saturday 29 June, we’ll be hosting our Family Day where we open our doors to the general public. As ever we are delighted to offer our main schools and family programme free of charge. On Thursday 27 June and Friday 28 June we are open to primary school groups from Key Stage 2. Find out more on our Schools' Programme page. On Saturday 29 June the festival is open to the general public. Join us for a fun-filled, exciting day of jaw-dropping shows and interactive exhibits. Lancashire Science Festival is growing and getting better every year. Remember to keep checking this page regularly for the latest news on what to expect in 2019. We’ll be adding more details throughout the run-up to the festival. The University of Central Lancashire’s Preston Campus is the home of Lancashire Science Festival. The area is currently undergoing a radical transformation as part of the University’s £200m Masterplan project. There is a lot of building work going on around the festival site so we are having to fit our programme around this. This may mean that there will be a slightly more limited capacity for the festival overall. The building work is constantly evolving so please check here regularly for further updates. After feedback and consultation with secondary schools, we have decided that Lancashire Science Festival will no longer feature a schools programme for secondary schools during the three-day event. Instead, we will soon be launching our new Lancashire Science Festival Roadshow which will bring some of the event’s most popular shows into school assemblies across the region. We’ll be able to bring the fun of the festival to more secondary school children than ever before. Our Festival Roadshow will be taking to the road from March to June 2018. Schools that apply for a visit will be entered into an open ballot and chosen at random. Unfortunately, we will not be able to visit every school that submits an application, but over the coming years, we will try to visit as many schools as possible. Please note that the ballat is now closed. Lancashire Science Festival will remain open for primary school children on Thursday 28 June and Friday 29 June. Please use this form to be added to our primary school mailing list. On School Days (Thursday 27 June and Friday 28 June) we will have dedicated parking and drop off area for coaches and minibuses on the University’s Fylde Road car park. This will be away from other traffic and should make it easier and safer for your school group to get to and from your transport. Unfortunately, parent or guardian drop off and pick up is no longer permitted due to limited car park capacity. Once again we will be running a first-come-first served-queuing system for our shows. During our Family Day on Saturday 29 June we will also be running several workshops. Unlike the main shows, for the workshops you will need to pre-book your place in advance for a small fee of £1 per ticket. By introducing a minimal charge we hope to ensure that everyone who books a place turns up on the day. It also enables you to guarantee your entry in advance. By requiring people to book their places in advance we can avoid having to turn people away and disappoint them when all the places have been filled. *All money received from tickets will be donated to Derian House (charity number 1005165) minus Eventbrite booking fee. At our Family Day on Saturday 29 June we have opted to retain a ticketless system for entry to shows. Taking this approach last year meant that we were able to run all shows at full capacity. We are introducing an improved queue management system which should mean that you will not have to wait in line only to be turned away if the show is full to capacity.  We are delighted to be able to offer free parking across all University car parks for the duration of Lancashire Science Festival. However, on site parking is very limited and so we are encouraging all our visitors to consider alternative options. Our Preston Campus is well served by public transport. Details can be found on our Visit Us page. More information about parking around the University can be found on our Frequently Asked Questions page. Parking is also available at Walker Street car park from just £3.70 for a full day. This car park is just a couple of minutes’ walk away from the main festival site. There will also be a number of car park attendants available to help you park safely and easily.